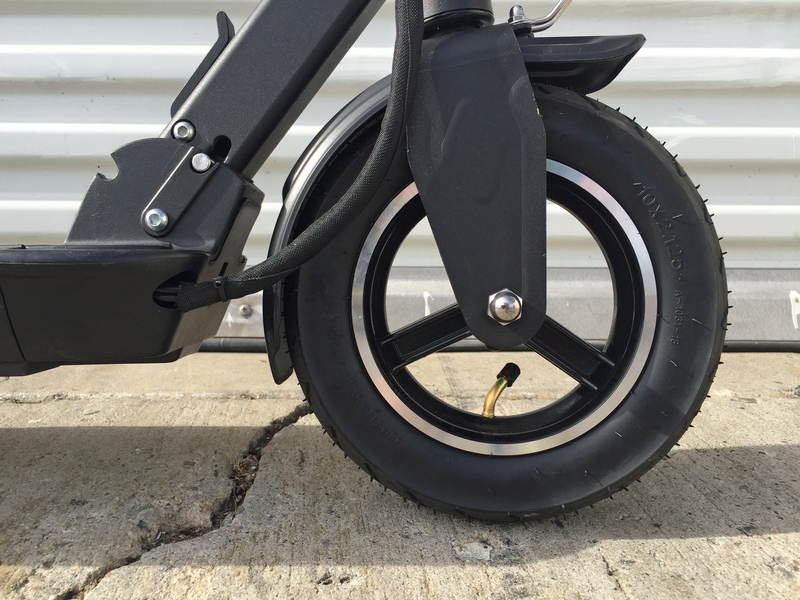 Hota Tyre, 10" x 2.125"
The Momas E-Scooter is an electric kick scooter that began its life on Kickstarter in October 2015. 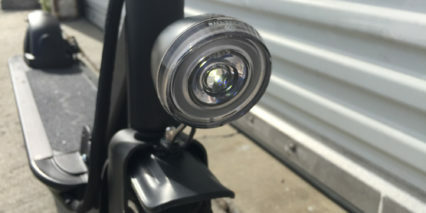 The company that designed it also designs and sells electric bicycles under the E-Joe brand and I’ve been reviewing them for several years now. 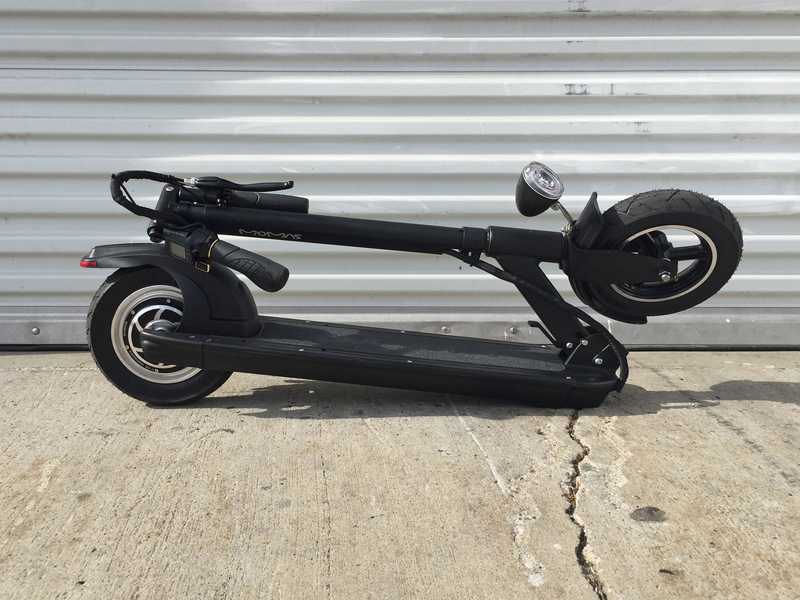 The company strives to balance cost and performance and that’s what I saw with the Momas… at ~$900 MSRP the scooter is much more than a toy. 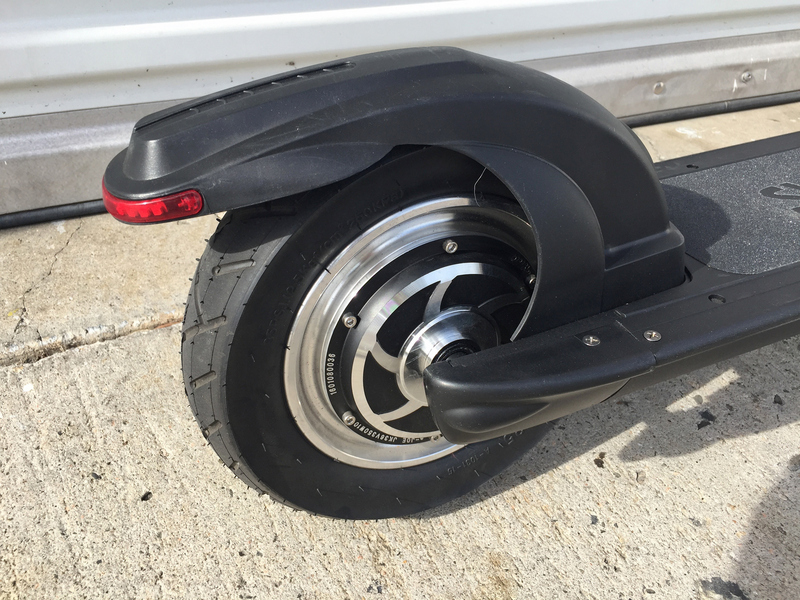 It’s designed to aid commuters and professionals who want to speed up their commute to and from bus stops, train stations, ferry boats and other “last mile” situations. 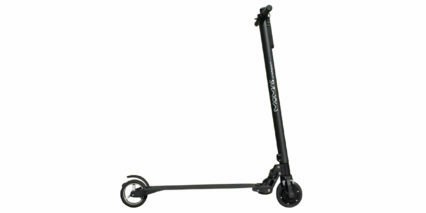 What struck me about it most was just how quiet it operates and how smooth it feels despite there being no suspension. 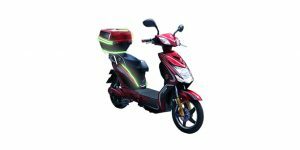 As someone with sensitive knees, I cringe at the thought of riding cracks and broken pavement when most scooters. 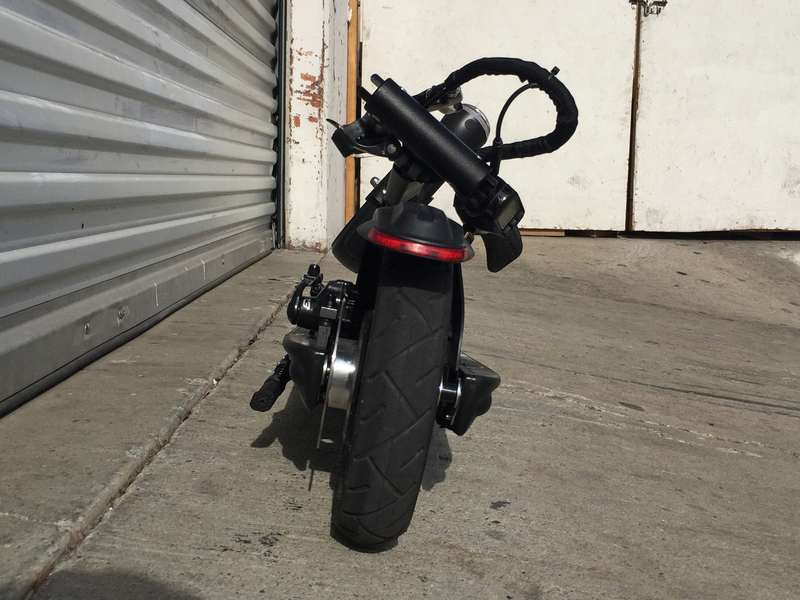 The tiny wheels just don’t absorb much of the impact so over time brands have begun introducing suspension and eventually air filled tires (just like bicycles) but this is one of the first models I’ve tried with both tires being air filled and sized at 10″ by 2.125″ much closer to the diameter of an actual bike. In practice, it works great and by foregoing suspension I think the complexity of the unit is reduced and it just seems simpler and strong. 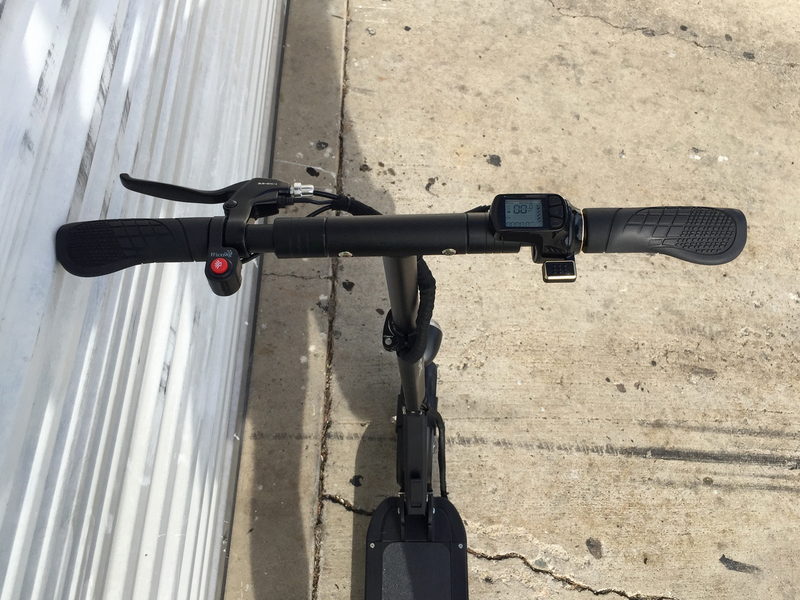 Everything is black including the deck, stem, handle bar and grips and I love that the touch points have been scrutinized for quality and performance. I love the ergonomic grips but one complaint here is the lack of lockers to keep them straight. 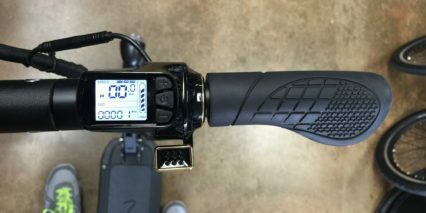 I noticed the left grip twisting a bit as I rode and really hung on tight. 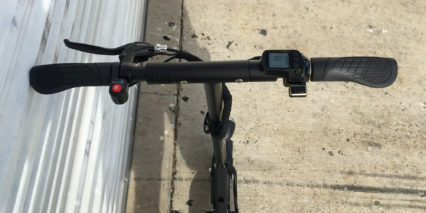 The brake lever is long, easy to actuate and quick to stop but because there’s only a back brake and weight shifts forward during deceleration I noticed some skidding action (and you can see and hear that in the video review). 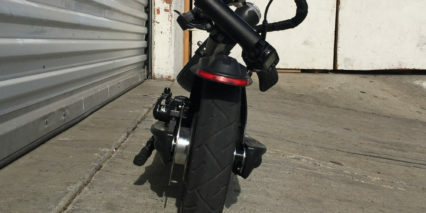 Anyway, I like the 120 mm disc brake rotor and how enclosed the rear end is, the axles are covered and no wires are protruding (which could get bent or snagged). Up front however, the wire bundle coming down from the brakes, trigger throttle and display are exposed and sort of bump up against the fender. It didn’t result in any issues and did stay out of the way nicely during folding but it gave me pause. 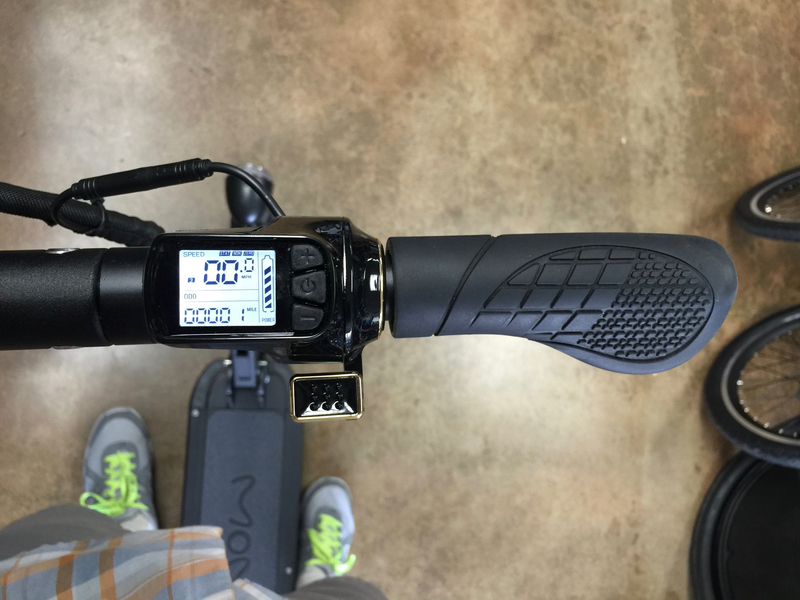 Riding the Momas is smooth and quiet thanks to its gearless hub motor design. 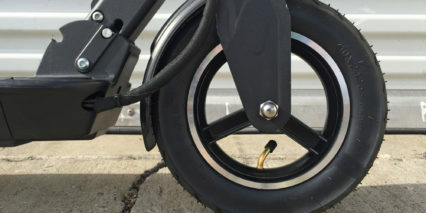 There is some cogging action (where the rare Earth magnets inside repel the electromagnetic staters when shut off) but this is common on e-scooters. I was able to reach ~20 mph relatively quickly when using power level three (there are 1, 2, and 3 levels) and acceleration was smooth and steady vs. zippy from start. 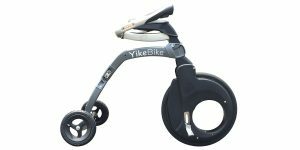 This is a good thing given the relatively unstable nature of small-wheeled kick scooters. 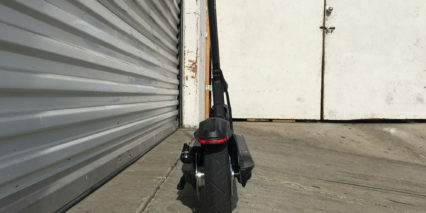 The included charger is light weight and compact so I could see myself tossing it into a backpack and charging at work, expect 15+ miles per charge varying by your weight and terrain. The scooter climbed fairly well but definitely fares better with some momentum going in. 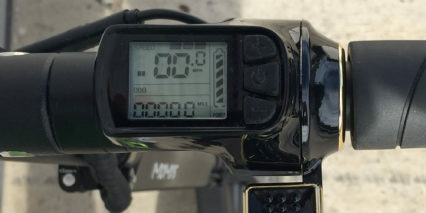 To activate the bike you press and hold the power button on the display then click it again to cycle through odometer, trip meter, timer and an error code readout. 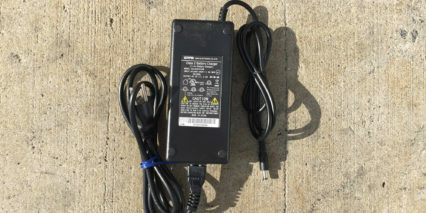 This LCD is clear and backlit with a faint white glow for easy viewing at night. I found that power level one topped out around 7-8 mph and worked well around other pedestrians. If you feel like adjusting speed settings or changing from miles per hour to kilometers per hour you can hold all three buttons and enter special codes which are listed in the manual linked in the resources section below. I didn’t experiment too much with this (and most electric vehicles have some sort of settings) but it was neat to confirm and to meet the founder of Momas, Willy. 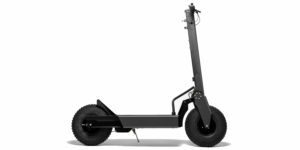 Hi, Nice review, Im just curious, I’m going to use it for going around in the campus and to bus stations and stuff in UC Davis. Since it has a huge campus, and everyone uses bike, but there are many thieves and not that many spaces or places to park. and the bikes are like cheap ones are already 400-500. and I just thought these would be very convenient to use it in the campus and i can carry it with me to class. So i’m just asking like, when its fully charged, would it be enough for one day? like go around the campus my classes, and like go to downown which is close and grab some food. and im like 100+kg. but no more than 110kg. 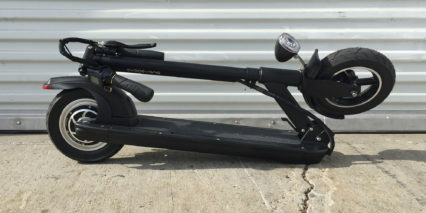 Or any suggestions from both other rides or from the kick scooter? Was wondering what you would recommend. I’m looking at the momas versus the i-max, s1+ . On paper their tech specs are similar in terms of distance and top speed. How ever I’m interested in the lighter weight of the momas. I have ridden the S1+ and I know being rated at 20mph on paper is not the same in real life. 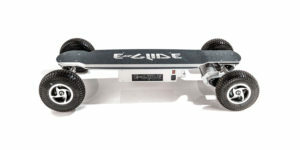 I can get to about 18mph on the s1+ , do you think the momas would be able to do the same with a smaller motor? 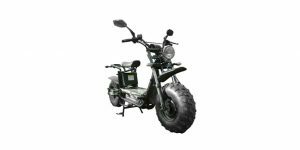 Do you think it could realistically do 15mph in the real world? I’m trying to decide if the weight savings is worth the speed trade off. If it could get me to at least 15mph I would be willing to take that over the heavier s1+. Thanks. How does it compare to the I-MAX S1+? It seems similar, but $400 less expensive. Is it as fast? Top speed and acceleration? 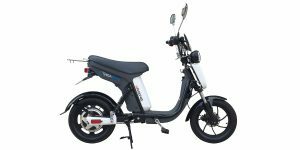 The I-MAX S1+ has a higher wattage motor and higher voltage batteries, but it is not clear if that actually is a real wattage number and if it translates into better performance. 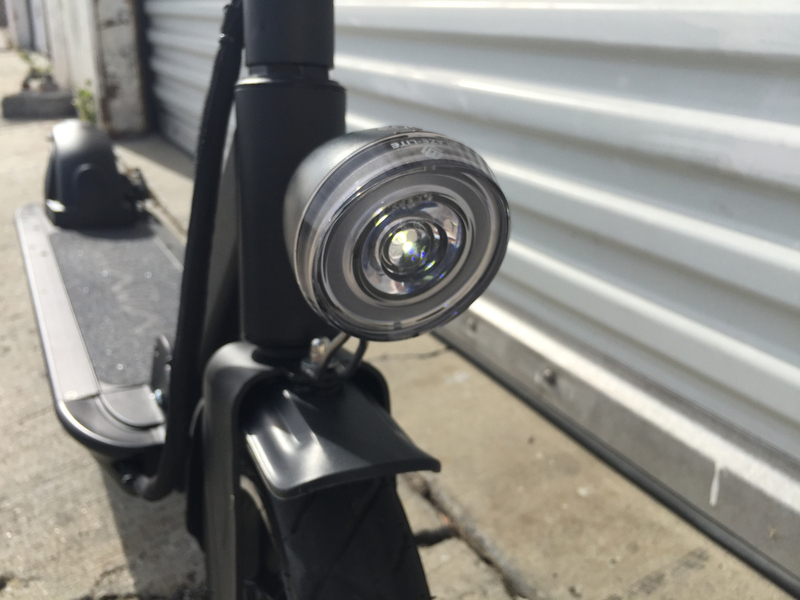 Also, how would you compare the performance to the EcoReco M3? Thanks! 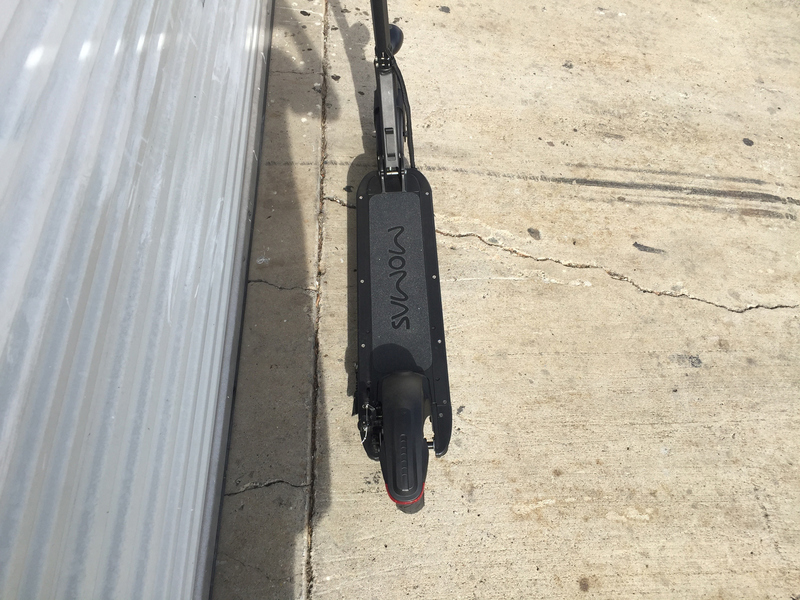 Any thoughts on comparing the speed of the Momas and Ecoreco M3 scooters? Which one do you think is faster? For someone who weighs same as you, about 140 lbs. Hi Court. I’ve narrowed it down to the Moma and the IMAX T3. 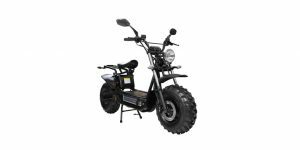 I live in New York City and would be using it for a 3 mile commute. Maneuverability, handling on rough roads and being able to quickly fold and unfold is important to me. 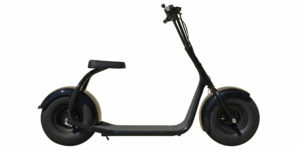 I also would like to take it on the subway with me so if I can drag on its rear wheel easily that would be ideal. Which would you recommend given an urban setting such as NYC? 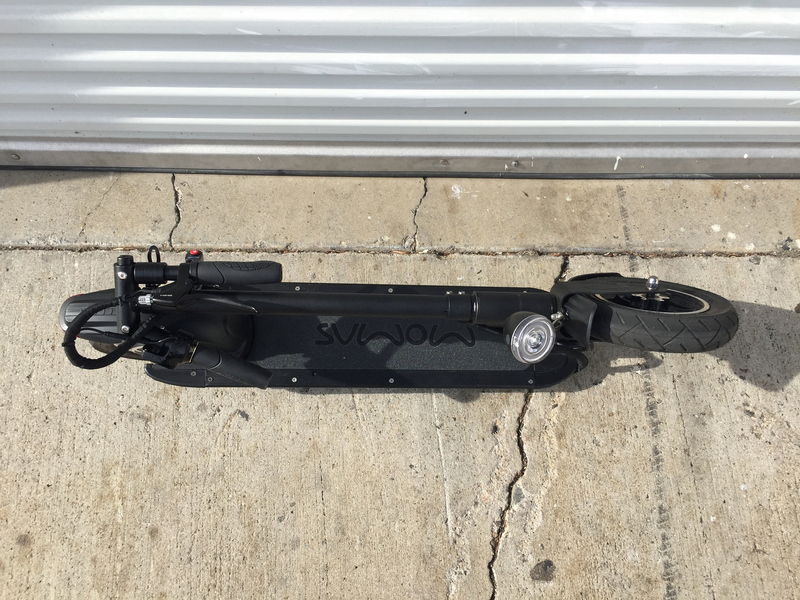 I really like the larger tires on the Momas and the display is great too… Both scooters could be dragged with the rear wheel but might not feel as stable or be as clean as the Glion Dolly which has a specific handle for this. I have just pulled by putting my hand around the front rim on the Momas and it worked alright. 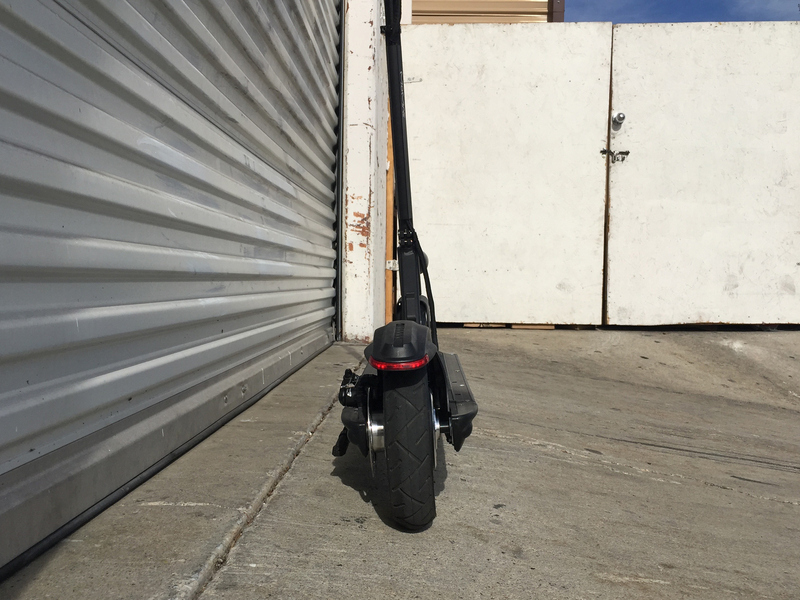 Surprisingly, even with the larger more comfortable tires the Momas is about the same weight as the IMAX T3. I think it would be my choice for comfort but you do risk getting flats. Maybe put in some Slime and carry a mini pump? Hi Court, I too have the same dilemma. I like the Momas and the IMAX S1+ They both have good points that I like. The momas display is sleeker and nicer, although I am drawn to the power of the IMAX although they are pressed to have the same top speed? I have seen someone get the iMax up to 22mph? Don’t know if this is true? I like your reviews and from a cost point of view the Momas looks more attractive. I know I am asking a lot but if you had to put your neck on the block as a buyer which would you purchase? Hey, Awesome review! Like many others, I guess, I am choosing between Momas and I-Max S1. So, after riding both Momas and S1 would you say that Momas is going slower or taking more time to get to the maximum speed? Is it harder to get up to hill on Momas compared to S1? I am most concerned about speed (I weight about 170lb). 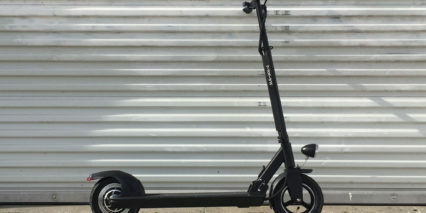 I know you’ve mentioned that you are a bit lighter but you got both scooters up to 20mph without any problems, right? Just trying to understand if I would get a better performance for that extra $400. 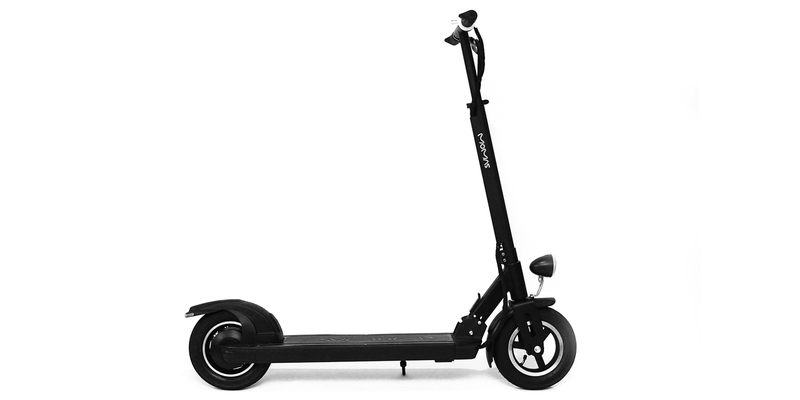 And, I know it is hard to answer, but which of the two scooters do you personally like more? Thanks! 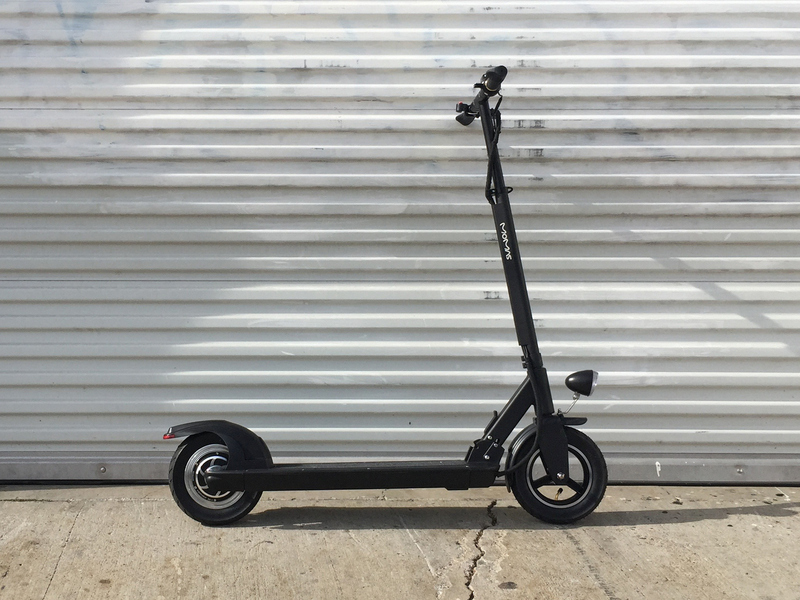 I ride a different scooter (Pleasedin Calista 2) which uses the same folding handlebar setup. 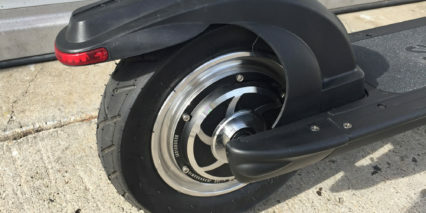 Have you noticed on this scooter that the handlebar ends wobble after a while? Unfortunately there’s nothing to “lock” the bars, only the springs that hold the collars in place. The new Inokim models (Light and Quick 3) solved this with threaded collars (can’t retro-fit those in this case). I’ve been thinking of ways to lock things down, so far the idea is to drill a hole in each of the collars to hold a grubscrew…has anyone else looked at other options? 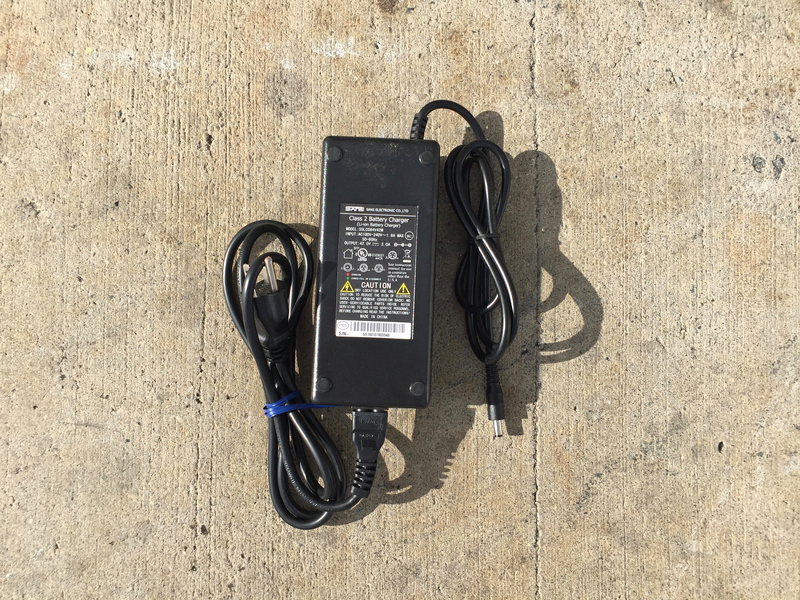 I’m trying to get some information (pricing, mainly) on the Calista Plus – 48v 500w on 10″ wheels. 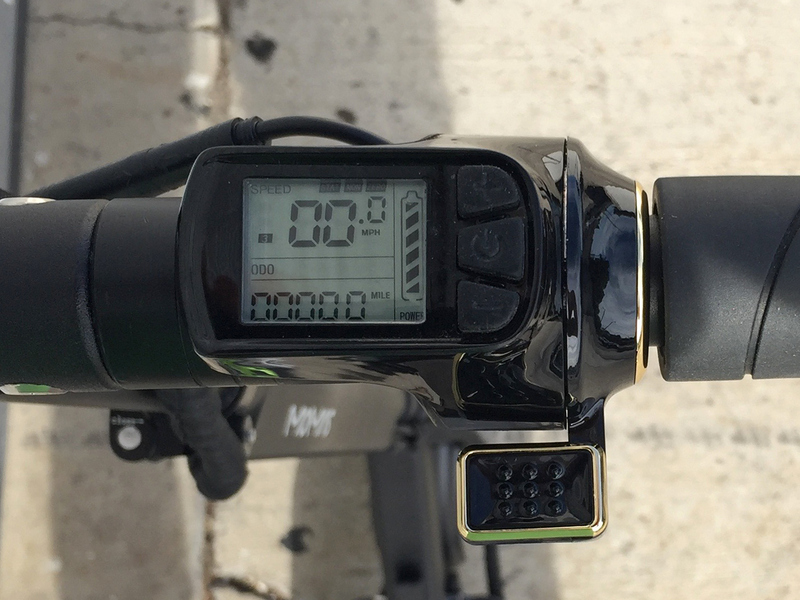 The Calista 2/Plus frame is solid as a rock, with only minimal flex from the handlebar stem. 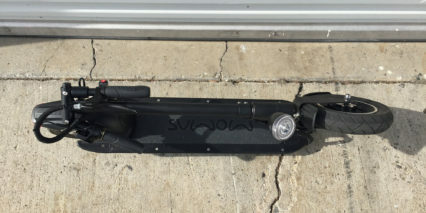 Hi, It seems to be exactly the same model as this one I was looking into here. 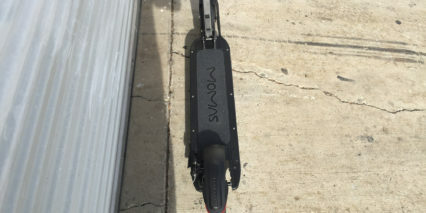 Seems to be a newcomer, but I don’t know if they just ripped the design or really is the Momas under a different name… only thing that puts me off is the weight : at 15kgs it’s no so easy to move around. 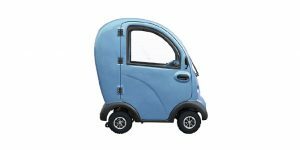 Interesting… Sometimes the manufacturer in China will sell direct or license the design to different companies in different geographical locales. Even if E-Joe and Momas created the design and are told that they own it I have heard that it is difficult to enforce design patents and copyrights sometimes in Asia. 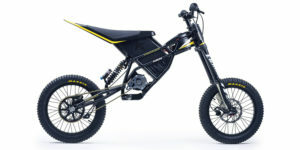 Hello, I am riding the German version of the Momas or Joyor models, the Wizzard 2.5 (shown here). As I do not have much information about the display’s function settings, I would really like to have a copy of the detailed PDF description you are referring to in your review. Is it still available somewhere on your website?